With political stability and security slowing creeping in into Tunisia, investors are also following suite. 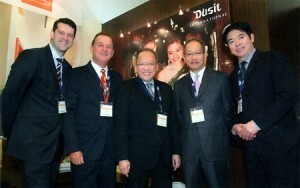 Dusit International has inked a deal to open a resort in the country’s third largest city, Sousse. Tunisia’s tourism sector is still struggling to recover after the 2011 events but Dusit International’s Managing Director and CEO Chanin Donavanik believes it is “an excellent time to enter this new market.” Sousse is a historic city known for its popular resort destinations. It boasts of receiving more than a million visitors per year and being listed as a UNESCO World Heritage almost 26years ago. In seems as if Dusit International will be limiting its expenses because it will be reconstructing an already existing hotel and rename it Dusit Thani Samara Sousse. Estimations have not been forwarded but doors of the resort are expected to be open by mid-2018. Posted by Geraldine Boechat on July 3, 2014. Filed under Business. You can follow any responses to this entry through the RSS 2.0. You can skip to the end and leave a response. Pinging is currently not allowed.